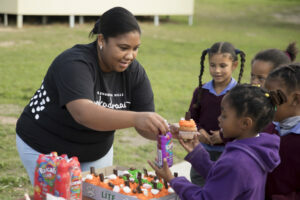 Stellenbosch Hills added festive cheer to the local farm community, when it shared in the 34th birthday celebration of neighbouring Vlottenburg Primary School and treated its Grade R – 7 learners and teachers to some tasty party pleasures on Friday, 18 May. Since 2008, this proud ly Stellenbosch wine brand has extended a helping hand to the school through its Polka Kids Community Project, which originated from their popular lifestyle wine range, Polkadraai. “The success of our wines is also the success of our community, so each year a percentage of all the Polkadraai wine sales is donated through an annual sponsorship to the school,” says Stellenbosch Hills winemaker James Ochse. The school has some 400 learners that include the younger children of most of the vineyard and winery employees at Stellenbosch Hills. Many of the families rely on social grants to supplement their household income. In 2017, funds made possible by Polkadraai were utilised for new blinds and to paint the Grade R classroom. Donations in previous years realised an impressive multi-sensory play park; a multi-media white-board for the school’s IT room and teacher training course; an overhead project or; and, a new stage for the school hall. This year’s Polka Kids Community Project donation will be determined by the school’s dire educational/teaching aid needs and revealed later in the year. “The Polka Kids Community Project makes every purchase of Polkadraai wine not only a good purchase, but a purch ase for good,” adds Ochse. Polkadraai wines deliver the quality and balance that Stellenbosch Hills is famous for in an easy-drinking, fun-loving format. In fact, the name says it all: Polkadraai is the country road that connects the vineyards used for its wines. It’s also a reflection of all things polka – from the lively dance that has its roots in Bohemia to the playful polka dot pattern.